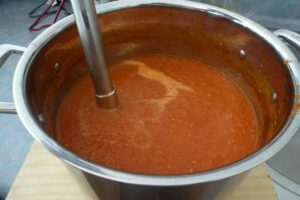 In this post I share my mother’s fabulous tip for how to make a really easy tomato puree, and lots of ideas for using all those tomatoes from your garden. Help, I’ve got too many tomatoes!! 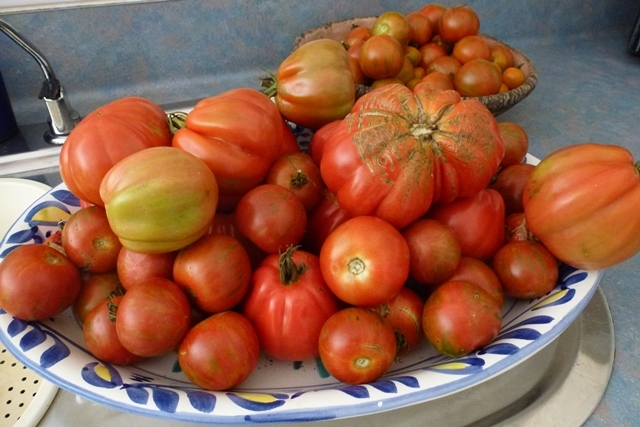 At peak tomato season you often get to a point when you’ve just got too many tomatoes to keep up with the preserving. You can freeze tomatoes whole – just put them whole into freezer bags (see Freezing Vegetables). 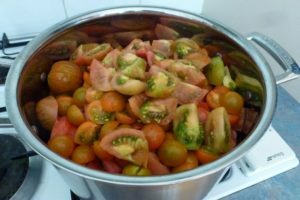 This is very quick and easy, but if you have lots of tomatoes then there may not be enough room in the freezer for them all. Chop the tomatoes roughly and remove the hard cores and any blemishes. Boil in a large pan for 3/4 hour to an hour until reduced in volume. 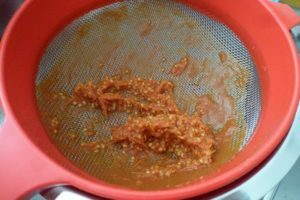 Process the tomatoes using a stick blender. 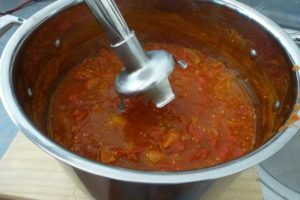 Strain through a sieve, using a spoon to push the tomatoes through until just the seeds are left in the sieve. 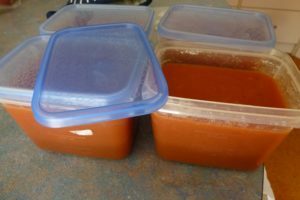 Spoon the tomato puree into plastic containers and put into freezer when cool. You can line the containers with plastic bags and then remove from the containers once the puree is frozen or take the frozen puree out of the containers and put the blocks into plastic bags if you wish. Alternatively, if your freezer is already full you can bottle the tomato puree. It also means that your puree is ready to go when you want it without having to defrost it first. I’ve read that tomatoes can be border-line as to whether they are acidic enough to bottle successfully so several recipes suggest adding a spoonful of citric acid or lemon juice per 500ml of puree. Then heat the puree back up to boiling and then ladle into hot sterilized jars and seal. 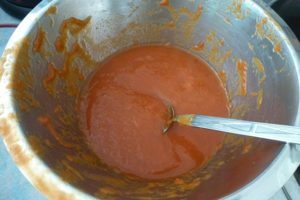 Then you can use your tomato puree for making whatever recipes you wish: tomato soup, tomato sauce etc.